Omron CP1W-CIF11 Port is needed in compact PLC's for RS485 and RS422 communication. But Many of us have the confusion regarding its hardware connection and Dip switch settings for RS422 and Modbus. So, here we will tell in detail that How to Configure Omron CIF11 for RS422 and MODBUS Communication. Omron CIF11 can be connected to PLC CP1E and CP1H , CP1E PLC comes with a inbuilt RS232 port so you have to connect it to second optional port and for CP1H you can connect it to either to one of two port. CIF11 Connection for RS422 Communication:- For setting up the CIF11 for RS422 communication , make the connections as per diagram below. Note:- Click on the picture for better enlarged view. This way your communication will take place in RS422 4 wire mode. To set up the CIF11 for Modbus communication first we have to make hardware connections. 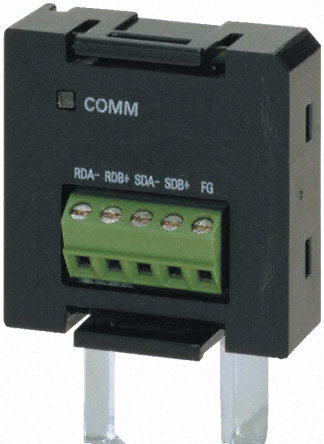 As there are 5 terminals on CIF11 namely RDA-, RDB +, SDA-, SDB + and FG out of these FG is for ground, As in MODBUS Communication it is always required to connect "+" with "+" and "-" with "-" terminal. So, you can use the either of two set i.e either you use RDA - and RDB + OR you use SDA - and SDB + for connection purpose. So make the connection as described above. So after these settings yours CIF11 is ready to use in MODBUS , still you need to configure it in CX-programmer for PLC programming purpose. So here we will also tell how to set up CIF11 in CX Programmer. Just open CX-Programmer and after slecting the type of PLC you are going to use , then click on settings and select the port where you connected CIF11, for example if you are using CP1E and connected to serial option port , then select serial option port and select MODBUS RTU master there, as in MODBUS communication Omron PLC is Master Device and select baud rate, parity, stop bit accordingly to yours slave devices connected in the MODBUS network and then click OK.
Now all your settings are done and CIF11 is ready to communicate in MODBUS. Below is a picture for better understanding. If you want more Information on MODBUS communication in OMRON PLC and PLC Program for MODBUS Communication then you can see here. You can subscribe to get all related posts in yours E-Mail. Subscribe to PLC, HMI Programming and SCADA Tutorials by Email. Great Post.. keep the Good Work up.